Hurricane Irene at 10:10 a.m., about two hours after it made landfall in Cape Lookout, North Carolina, on August 27, 2011. It’s not yet hurricane season, but one tropical storm (Ana) is already in the books. Fortunately, the storm did little damage, and it actually precedes a hurricane season that most forecasts indicate is going to feature a below-average number of storms. Forecasters expect two factors to work against tropical storm formation. An El Niño pattern is expected to develop in the Pacific, which should cause wind shear in the Atlantic. Wind shear kills tropical storm development. At the same time, lower temperatures are expected to dominate in the eastern Atlantic, which also makes the formation of storms more difficult. Since 1984, Colorado State University’s William Gray (now with Philip Klotzbach) has been issuing early June tropical storm forecasts based off environmental factors like those mentioned above (among other statistics). The forecasts have been pretty good given that early June is 10 weeks before the beginning of peak hurricane season (mid-August to late October). If these forecasts hold over the next few weeks, chances are that the season will fall below the 30-year normal of 12.1 tropical storms. 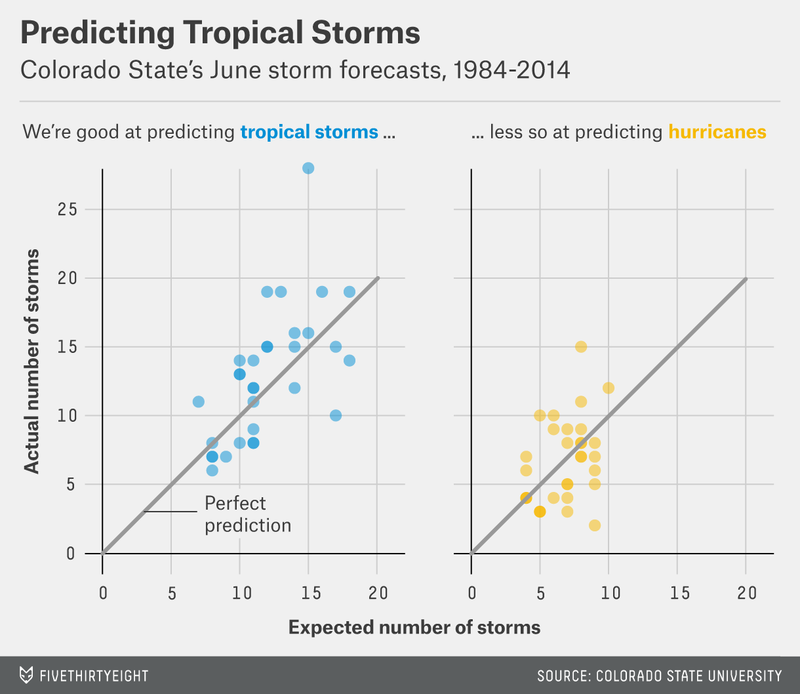 There is a clear correlation (0.62) between the forecasts and the eventual number of tropical storms. In the 31 June forecasts, the average miss was a little less than three storms. Only the forecast for the record-breaking 2005 season was off by more than seven. Even in that year, though, the forecast called for an above-average 15 tropical storms. The point is that if Colorado State’s April forecast of seven storms holds through early June, then we’re looking at a greater than 70 percent chance of a below-average season based on past accuracy. The April forecasts (issued for only the past 20 years and not as accurate as June’s) have never differed by more than three storms from the June predictions. NOAA’s Climate Prediction Center (CPC), which will issue its May forecast in the next few weeks, has had a similar track record.1 The average in its range forecasts has been off by 3.7 storms since it began issuing range forecasts in 2001. (A range forecast is what it sounds like: forecasting a range for the number of storms in a season.) During the same stretch, which includes the 2005 outlier, Colorado State’s forecasts have been off by an average of 3.4 storms. Since the CPC started issuing a probability for its ranges in 2008, its 70 percent confidence interval has captured the actual number of tropical storms 71 percent (five out of seven) of the time. While the number of tropical storms that form can be forecast with reasonable accuracy, Colorado State’s forecasting of the wind speed for these tropical storms has not added nearly as much information to how many storms there will be. Since 1984, the correlation between predicted hurricanes (tropical storms with sustained winds of 74 mph or greater) in June and the eventual number (0.36) is worse than for tropical storms. Both tropical storm and hurricane forecasts have a median error of two storms, but since 1984 we’ve always gotten two to 15 hurricanes each season, compared with six to 28 tropical storms. That means it takes much more skill to get closer to the correct number of tropical storms. Over the past 14 seasons, the correlation between the predicted number of hurricanes and the actual number has been only 0.19 for both Colorado State and the CPC. In other words, there hasn’t been much of a relationship at all. That’s not too surprising given that forecasters still have a difficult time forecasting the intensity of a hurricane even a few days out. Even so, if the June hurricane forecast calls for three storms, there’s a little less than a 70 percent chance of a below-average number of hurricanes (six) based on Colorado State’s accuracy over the past 31 years. Overall, we’re likely looking at a normal to below-average season for tropical activity, unless something changes. That doesn’t mean anyone is out of the woods. All it takes is one tropical storm to make landfall to cause a lot of damage. So continue to keep an eye out. Tropical Storm Risk, which was calling for 11 tropical storms in its April forecast, has a similar track record for its June forecasts.